They certainly do use hybrids and in increasing numbers. Hybrids are not just for average golfers and duffers. Some of the best golfers on the planet have replaced their 2-irons and 3-irons or 5-woods with hybrid clubs. While there are still significant holdouts, such as Paul Casey, hybrids have become commonplace on the PGA, LPGA and Champions Tour. A hybrid is a cross between a fairway wood and a long iron. CBS golf commentator Gary McCord came up with the idea in 2002 and took it to the TaylorMade company, which produced the first hybrids. They were similar in many ways to rescue clubs and bafflers, which are fairway woods with smaller clubheads and sometimes rails on the sole to make it easier for the club to cut through rough and sand. Hybrids are a little shorter than a 5-wood and use the same shafts and irons. The design of a hybrid moves the center of gravity back and lower on the club, which enables players to get the ball in the air more easily and at a higher trajectory. Lee Trevino, when caught in a lightning storm, raised a 1-iron to the sky and said to the gallery, "Now I'm safe. Even God can't hit a 1-iron." That's a slight exaggeration -- Ben Hogan won a U.S. Open with an amazing 1-iron shot -- but generally true. 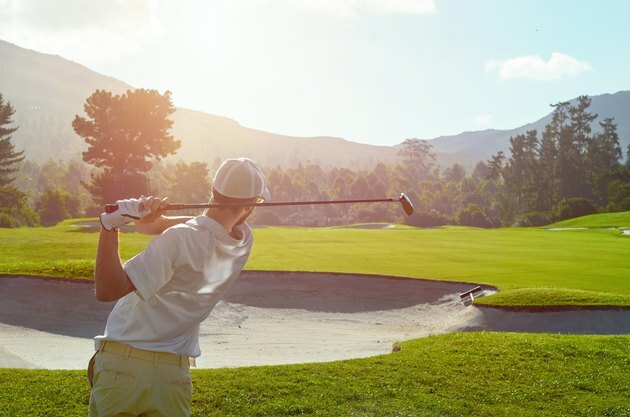 Many pros have discovered that from 210 to 240 yards a hybrid is better than a 1-iron, 2-iron or 3-iron, since it enables them to hit the ball higher and land it more softly on the green. Hybrids sometimes replace fairway woods as well as long irons. Jimmy Walker, winner of the 2014 Sony Open carries a Titleist 913H.d hybrid, while Mark Wilson won the 2011 Sony Open carrying two hybrid clubs, a 17 degree Ping i15 and a 20 degree Ping i15 -- the clubs that replaced the 2-iron and 3-iron in his bag. Phil Mickelson carries a driver, 3-wood and hybrid Callaway Prototype. Pros tend to mix and match clubs and brands, so you see all sorts of combinations of clubs in the bags of PGA Tour players. Other prominent players who carry hybrids include Jim Furyck, Davis Love III and Tiger Woods, a recent convert to the hybrid clubs. Women pros have adopted hybrids in large numbers. There are still a few holdouts such as veteran Meg Mallon, who carries several woods, a driver, four fairway woods up to an 11-wood and irons ranging from a 5-iron through pitching wedge. But most LPGA players use at least one hybrid club. Helen Alfredsson, for example, carries a TaylorMade Dual 22 hybrid instead of a 3-iron. Japanese star Ai Miyazato uses Bridgestone Tour # 3 and # 4 hybrids and a 5-iron though pitching wedge. The older men have adopted hybrids as readily as the women pros. Tom Watson, one of the finest ball-strikers in the history of the game, packs a driver, 3-wood, and hybrid Adams Idea Pro 18, which essentially replaces his 2-iron. As Golf Club Revue says, "A golfer who doesn't have a hybrid in the bag is the exception, not the rule." Golf WRX: Are Hybrids on the Way Out? Golf Today: What's in the Bag of Paul Casey?